— April 2020, Salamanca, Spain, Festival Primavera USAL, performance of different works by the New Made Ensemble. — April 2020, Conservatorio Superior de Música de Castilla y León (Salamanca, Spain), Composition Masterclass. - 25.09.2019, Latina, Italy, Conservatorio "O. Respighi, Lacrymosa I (2001), for accordion or any aerophone instrument, Vincent Lhermet, accordion. - 17.10.2019, Mexico City, Auditorio Blas Galindo, Centro Nacional de las Artes, Lacrymosa I (2001), for accordion or any aerophone instrument, Vincent Lhermet, accordion. - 16.10.2019, Mexico City, Casa de Francia, Lacrymosa I (2001), for accordion or any aerophone instrument, Vincent Lhermet, accordion. - 12.10.2019, Guanjuato, Mexico, Lacrymosa I (2001), for accordion or any aerophone instrument, Vincent Lhermet, accordion, Festival Internacional Cervantino. - 10.10.2019, Guanajuato, Mexico (more information soon), Lacrymosa I (2001), for accordion or any aerophone instrument, Vincent Lhermet, accordion. - 3.10.2019, Paris, Institut Culeturel du Mexique, Lacrymosa I (2001), for accordion or any aerophone instrument, Vincent Lhermet, accordion. — 5 to 7 June 2019, Conservatoire Supérieur de Musique et Danse of Lyon, France, Electroacoustic Composition Seminar. — 15.04.2019, Pamplona, Spain, Conservatorio Superior de Música de Navarra, Composition Masterclass, live performance of Orior, Candida Felici (piano). More information (pdf). — 10 to 14.04.2019, Zaragoza; Spain, Conservatorio Superior de Música de Aragón (Spain), Composition Masterclass: "Modelos Naturalísticos y Artificiales en mi Música", live performance of Orior, Candida Felici (pianist). — 04.04.2019, Conservatorio de las Rosas, Morelia, Mexico, Tres Estudios para Violín (2001), Concert seasson of the Conservatory of Morelia, Julián Martínez Vázquez (violin), Web concert program (pdf). — 20.03.2019, Brest (France), De Ignoto Cantu (2005, version for five players and electronics) and Tiento (2000), version for violoncello and electronics -French premiere-, Ensemble Sillages, International Festival Electr()cution (OPENING CONCERT), Centre Culturel d'Art Contemporain "Passerelle". Web concert program, Press kit. — 17.02.2019, Mexico City, Orior (1997), for solo piano. Carlos Adriel Salmerón (piano), concert season "El arte del piano", Sala Manuel M. Ponce, Palacio de Bellas Artes. Web concert program. - Phoenix Ensemble of Basel, commission, new work: Double-concert for two guitars and ensemble, dedicated to Pablo Márquez and Maurizio Grandinetti. - New work for oboe and electronics commissioned by Pilar Fontalba. - New work commissioned by the New Made Ensemble. — 08.12.2018, Mozarteum in Salzburg (work commissioned by the Mozarteum), International Contemporary Music Festival Crossroads, Salzburg: World premiere of High over the distant horizon (2018), for electric-organ, piano, cello and five players in movement (flute, bass-clarinet, percussions, violin) and electronics, Work composed for the 60Th anniversary of the Mozarteum's Electronic Music Studio - World Premiere: Solitaar Saal, Mozarteum In Salzburg, New Arts and Music Ensemble Salzburg. — 06.12.2018, Festival Crossroads, Zimmer 4006, Universität Mozarteum, Salzburg — Lecture: "Beyond the Distant Perceptive Horizon: Naturalism, Artificiality and Musical Invention". — 06.10.2018, Jake Arditti And The Arditti Quartet, World Premiere: ...un lume per lo mar ... (2016-2018), for counter tenor and string quartet — XL Foro Internacional De Musica Nueva "Manuel Enriquez", Sala Principal, Palacio de Bellas Artes, México City. -21 July 2018, Concert "Harmonices Mundi", work performed: Imágenes de la Caída de Altazor (2003), for two pianists and two percussionists, Ensemble Sillages Candida Felici and Mara Dobresco (pianos), H. Combotti (perc.) and Victor Hocquet (percussions), Auditorio Blas Galindo, Cenart. -26.07.2018, 19:00 h, Concert: "Astronomia Nova", in memoriam Graciela Agudelo. Auditorio Blas Galindo, Cenart, 19:00 h, work performed: Invención, for solo violin. Young performers of Taller de Música Contemporánea of the Unidad Académica de Artes, Universidad Autónoma de Zacatecas, Joel Morales Rodríguez, Juan Diego Hernández Cervantes, Isaías Villalpando Dávila, Fabián Rivas de Santiago. Mtro. Alejandro Barrañón. -19.07.2018: CD PRESENTATION, Salón 212 o 213, Escuela Superior de Música, "Sidereus Nuncius (the sidereal messenger)": presentation of the monographic CD the more recent essay by Javier Torres Maldonado. well as the poetic texts by José Manuel Recillas created ex profeso for the work. Javier Torres Maldonado & José Manuel Recillas. -21.07.2018: Salón 222 o 212, Escuela Superior de Música, 16:30 h Ronde table "Sonido e idea, proceso de composición y complejidad perceptiva: ¿elementos para una escucha ideal de la música del siglo XXI?" Invited artists: Phillippe Arri-Blachette, Ludwig Carrasco, Francisco Cruz, José Manuel Alcántara, Chair: Javier Torres Maldonado. 25.07.20128, Salón 222 de la ESM, 10:00 h Lecture: "Objetos sonoros, dramaturgia musical y proceso compositivo" , Javier Torres Maldonado. -26.07.20128, Salón 222 de la ESM, 12:00 h, Masterclass for composers and clarinetists: "Desde el instante" de Javier Torres Maldonado, aspectos técnicos e interpretativos, Prof. Camilo Irizo (Clarinet Professor, Conservatorio Superior de Música "Manuel Castillo" de Sevilla) and Javier Torres Maldonado. - 28.07.20128, 16:00 h, ronde table: "Retos de la Música del Siglo XXI". Artists invited: Fabián Panisello, Ludwig Carrasco, Marcela Rodríguez, Ignacio Torner, Camilo Irizo, Javier Torres Maldonado. Chair: Dulce Huet Covarrubias. — 15.06.2018, Festival International du Domaine Forget de Charlevoix, Quebec, Canada, Interstizi, for violin and cello. Concert: "Prelude à l'été", Quatuor Bozzini [Alissa Cheung (Violin), Isabelle Bozzini (Cello)], Concert Hall Domaine Forget. — June 10 to 23 2018, Invited Professor, Composition Masterclasses, International Music Academy "Le Domaine Forget", Canada. Ensemble In Residence: Quatuor Bozzini. June 10 to 23, 2018, Le Domaine Forget, Canada: Javier Torres Maldonado is the Invited Professor to teach masterclasses in composition, International Music Academy Le Domaine Forget. Application deadline: January 29, 2018. Ensemble in residence: Quatuor Bozzini. For more information please visit the link to Domaine Forget international music academy: Composition Course. May 16-17, 2018, Conservatoire de Strasbourg (Académie Supérieure de Musique), France: composition and electro-acoustic composition masterclasses. 21.04.2018, Freiburg, Switzerland: Lacrymosa I (2001), for solo accordion. Vincent Lhermet, accordion. Conservatoire de Fribourg, Route Louis Braille 8 - Friborg, Switzerland. 24.03.2018, Palma de Mallorca, Spain, Masih (2012), for saxophone quartet, X Mallorca Saxophone Festival 2018, Komea Sax Quartet, Conservatorio Superior de Música de les Illes Baleares, works by Berio, Mendelssohn, Escaich and Torres Maldonado. Concert program (pdf). 17.03.2018, Helsinki, Finland, Lacrymosa I (2001), for solo accordion. Vincent Lhermet, accordion. Concert organized as part of the celebration of the 40 years of Sibelius Academy Accordion Class. Musiikkitalo, organo sali. Mannerheimintie 13, Helsinki, Finlande. Sibelius Academy event (pdf). 28.01.2018, Mexico City, Figuralmusik II (1997), for ensemble (10 players). Ensemble Cepromusic conducted by José Luis Castillo. Palacio de Bellas Artes, Sala Manuel M. Ponce, Mexico City. Concert program. 2018-2021, Mexico City: Javier Torres Maldonado has been nominated as member of Sistema Nacional de Creadores de Arte (National Endowment for Culture and Arts) of Mexico. Spain, new CD: Alborada (2005), version for soprano saxophone and electronics has been included as the opening work of the new CD S3 Spectral Sax Style. Performers: Jesús Núñez (saxophones) and Juan D. García Aguilera (electronics). — Mexico, new CD: Orior (1997), for piano or fortepiano was included as opening work in the new CD "Odisea Avant-Garde, Mexican Piano Music", a project ot the pianist Alejandro Barrañón. Link to Spotify. 2016-2017, Germany: composition commission, Ernst von Siemens Musikstiftung, new piece for the Ensemble Klangforum of Vienna - World premiere: Festival Internacional Cervantino, Mexico. 01.12.2017, Seville: Spanish premiere, Espira I, II (2005), for guitar, violin, violoncello and piano. Pablo Gómez, guitar, Ensemble Taller Sonoro, Festival "Encuentros Sonoros 2017", Sala Joaquín Turina of Seville Cultural Center. 24.11.2017, La Rioja, Spain: De ignoto cantu (2003), version for bass-clarinet, percussion and violoncello. Ensemble Taller Sonoro, Spanish tour, Sala de Usos Multiples de la Gota de Leche, III Festival de Música Contemporánea de La Rioja, Logroño, Spain. 16.11.2017, German premiere: Un posible día, quasi un radio dramma, for female voice, actor, ensemble, interactive electroacoustic system and video (ad libitum). Ensemble Courage, Klangnetz Dresden, Deutsches Hygiene-Museum, Dresden. Bach contemporaneo project, Schwartzsche Villa, Berlin. 25,10,2017, Guanajuato, Mexico, Móvil, cambiante, for ensemble (14 instruments), work commissioned by the Ernst von Siemens Foundation and the Festival Internacional Cervantino for the Ensemble Klangforum of Vienna. World premiere: 25.10.2017, Ensemble Klangforum of Vienna conducted by Bas wiegers, Teatro Juárez, Guanajuato, Festival Internacional Cervantino. Móvil, cambiante, Klangforum's web site. Processi e Traiettorie, an article about "Móvil, cambiante" published by ESZ News Magazine, No. 74, October 2017, in Italian. 24.10.2017, Pamplona: Huayra-Yana (2012 version), for bass-flute and electronics. Alessandra Rombolà, bass-flute, Juan José Eslava (electronics), International Festival of Music Experimentation "After Cage", Teatro Gayarre of Pamplona, Spain. Program: La ciudad ascendente, vertical y mítica. Performers: Colectivo e 7.2. Link to the Teatro Gayarre web page, also in pdf format. 23.10.2017 — Reggio Emilia, Italy, Natura interiore (2017), for 5 players, Diabelli Variations Project, Divertimento Ensemble, Sandro Gorli (conductor) - Festival Aperto, Teatro Cavalleriza de Reggio Emilia, Italy. Paso da Cultura, Vigo, Spain. 15.10.2017, Madrid, De ignoto Cantu (2003), version for bass-clarinet and percussion, Ensemble Taller Sonoro, Spanish tour, Teatros del Canal, Teatro Verde, Madrid. 30.09.2017, Mexico City, Esferal (2006), for orchestra and electronics, National Symphony Orchestra of Mexico, inaugural concert, Foro Internacionl de Música Nueva "Manuel Enríquez", Mexico City. THE INAUGURAL CONCERT OF THE FORO DE MUSICA NUEVA "MANUEL ENRIQUEZ" WAS CANCELLED IN RESPECT OF THE VICTIMS OF THE EARTHQUAKE IN MEXICO. 30.10.2017. Mexican premiere: Espira I, II (2005), for guitar, violin, violoncello and piano, Pablo Gómez, guitar, Ensemble Taller Sonoro, Ciclo Internacional de Música "Laberintos Sonoros", National Center for the Arts, Mexico City. 29.07.2017, Mexican premiere: De ignoto cantu (2003), version for bass-clarinet, percussion and electronics, Ensemble Taller Sonoro, Ciclo Internacional de Música "Laberintos Sonoros", National Center for the Arts, Mexico City. 25.07.2017, Mexico City, Huayra Yana (2012 version), for bass flute and Alborada (2004), for soprano saxophone, Ciclo Internacional de Música "Laberintos Sonoros", National Center for the Arts, Mexico City, concert/conference "Paradigmas naturales y artificiales, invención musical y nuevas técnicas instrumentales en “Huayra Yana” y “Alborada”, así como en otras de mis obras. ", Javier Torres Maldonado, Birgit Nolte (flutes) and Isabella Fabbri (saxophones), Centro Nacional de las Artes, Salón 222, Escuela Superior de Música. 02.04.2017, French premiere: Lacrymosa I-b, for accordion and electronics, Francesco Gesualdi, accordion, Festival "Resonance Contemporaine", Salle Figuration, Bourg-en-Bresse, France. 30.03.2017, Brest, France, World premiere: Inoltre (2017), for piano and electroacoustic system, work commissioned by the Ensemble Sillages. Festival Electr()cution, Centre Culturelle Pasarelle, Brest, France. Vincent Leterme, piano. 27.03.2017, Mexico City, Desde el instante (2002), for clarinet (corno di bassetto version by Antonio Rosales). Antonio Rosales, corno di bassetto, Foro Casa de la Paz, Instituto Nacional de Bellas Artes, Mexico City. 14.02.2017, Bilbao, Spain, Hemisferios Artificiales, for 2 instrumental groups, Ciclo de Conciertos de la Fundación BBVA, Ensemble Kuraia conducted by Andrea Cazzaniga, Fundacion BBVA, Bilbao, Spain. 01.02.2017, Milan, Italy, World premiere: Oltre (2017), for ensemble (10 instruments), work commissioned by Divertimento Ensemble. Teatro Litta of Milan, Italy. 20.12.2016, World premiere: Lacrymosa i-b, for accordion and electronics. Francesco Gesualdi, accordion, Experimentalstudio des SWR of Freiburg, GAMO concerti, Florence, italy. Concert program. 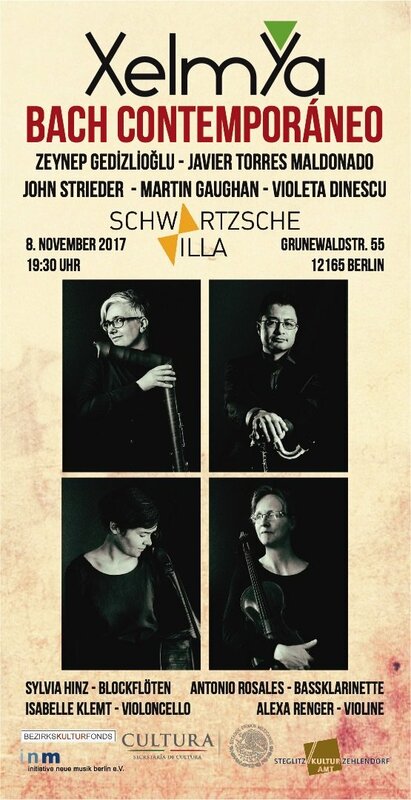 24.11.2016, Desde el instante (2002), for solo clarinet (German premiere), concert Wie klingt Mexiko? Von Maya bis Elektrosound. Antonio rosales, clarinet. Veranstaltungssaal der Zentrale des Goethe-Instituts München, Munich, Germany. Link. 15.10.2016, Alborada (2004), for soprano saxophone and electronics. S3 spectral Sax Style: Jesús Núñez	& Juan D. García Aguilera. Projecte Rafel Festival, Auditori Rafaelbunyol, Valencia, Spain. Pdf archive and web link. 09.2016, New CD project, recording of Orior (piano version), Odisea Avant-garde: Mexican Music for Piano" — Alejandro Barrañón, piano. For more info please visit CDs/DVDs. 11.10.2016 — Composition masterclass: "Artificial paradigms in my work". After the conference was performed Hacia el umbral del aire (2005), for accordion and electroacoustic interactive system. Accordion: Francesco Gesualdi and Nicola Tommasini. Auditorium "Daniele Paris", Conservatorio "L. Refice" of Frosinone, Italy. 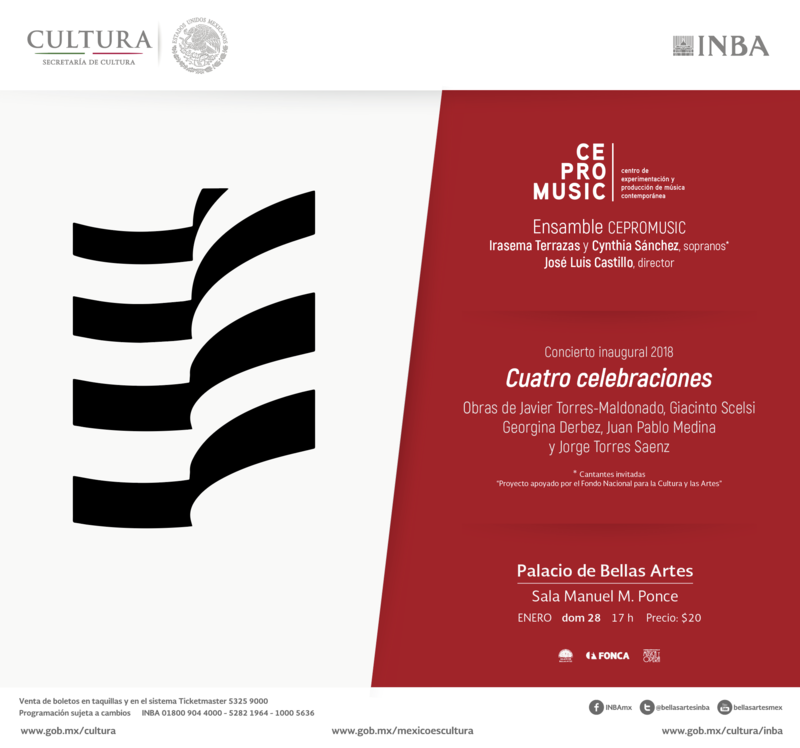 07.2016 — Composer in residence, National Center for the Arts, Mexico City. New work for countertenor and string quartet dedicated to Jake Arditti and Arditti String Quartet. Work commissioned by the SNCA with funds of Ibermusicas. During the artistic residence there were organized, as a part of the Ciclo Internacional de Música "Laberintos Sonoros", a concert series dedicated to the music of Javier Torres Maldonado. More info: LINK to the Cenart web site, PDF info. 11.06.2016, Toronto, Montuno y Canto (2006), for 2 violins, Canadian premiere, Festival México Contemporáneo. Paulina Derbez, Humberto López, violins. 13 and 14.06.2016, Málaga, Composition masterclass, Invited professor, Conservatorio Superior de Música of Malaga (Spain). 27 and 28.05.2016, San Sebastián, Composition masterclass, Musikene — Centro Superior de Música of the Basque Country, San Sebastián, Spain. 11.05.2016, Seville, Spanish premiere of Hemisferios Artificiales (2002), for two instrumental groups and Iridiscente (2011), for piano and percussion, Ensemble Taller Sonoro, Teatro Central of Seville. 04.05.2016, Livorno, World premiere: Enim adscititios accidentalesque a stellis fulgores adimit (2009-2016), acousmatic composition, International Festival "Suoni Inauditi ", Istituto Superiore di Studi Musicali "P. Mascagni", Auditorium. 17.04.2016, Invención (2002), for solo violin, Greek premiere, recital of solo violin performed by Tania Sikelianou, Athens Conservatory, Greece . 15.04.2016, Paris, Second String Quartet (2015), Ensemble Sillages, Eglise de Saint-Mary, Les Rendez Vous Contemporains de Saint-Mary. From 10 to 17.03.2016, Salamanca, Invited professor: composition seminar and masterclasses, Conservatorio Superior de Castilla y Leon. Spanish premieres of Imágenes de la caída de Altazor (2003), for 2 pianos and 2 percussionists, and Orior (1997), for piano solo. Performances of Masih (2012), for saxophone quartet and Rosa Mutabile (2010), for two instrumental groups. Candida Felici (piano), Leonardo Bartali (viola), Ensemble del Taller de Música Contemporánea of Conservatorio Superior de Música de Castilla y León, Spring Festival of the University of Salamanca. 2014-2015, France — Commande de l'État 2013, French Ministry of Culture, Second String Quartet, work commissioned by the Ensemble Sillages. 19.12.2015, Valencia, Spain, Desde el Instante (2002), for solo clarinet, Camilo Irizo, clarinet, concert of the Ensemble Taller Sonoro, Instituto Valenciano de Arte Moderno, Festival Musiques de Nova Creacio'. 11.12.2015, Seville, Spain, Desde el instante (2002), for solo clarinet. Camilo Irizo, clarinet, concert of the Ensemble Taller Sonoro, Espacio Turina, Ciclo de Música Contemporánea Encuentros Sonoros 2015, Festival de Ensembles, LINK. 19 to 23.11.2015, Seville, Spain, Cátedra Manuel de Falla, Festival of Cadiz, visiting professor (composer nominated to the Cátedra Manuel de Falla 2015), VIDEO. Javier Torres Maldonado was Invited Professor and Composer in residence for the prestigious "Cátedra Manuel de Falla of Seville". His lectures were scheduled at the CONSERVATORIO SUPERIOR of Seville. He taught different masterclasses to the 12 young composers chosen by him as students, every piece composed by them was recorded by the Ensemble "Taller Sonoro". A concert including them was scheduled by the FESTIVAL DE CADIZ. 09.11.2015, Logroño, Spain, Desde el instante (2001), for solo clarinet. Camilo Irizo, clarinet, concert of the Ensemble Taller Sonoro, Festival de Ensembles, Palacio de Congresos, Riojaforum, Spain. LINK. 08.11.2015, Zaragoza, Spain, Desde el instante (2001), for solo clarinet and Primer libro del canto alado (2006), for piccolo, flute, flute in G and bass flute (1 player), concert of Ensemble Taller Sonoro, Sala Luis Galve, Auditorio de Zaragoza, Festival de Ensembles, Spain, LINK. 02.10.2015, Interstizi (2003), for violin and violoncello, Spanish premiere, concert of Ensemble Sillages, VI Ciclo de Conciertos de Música Contemporánea de la Fundación BBVA, LINK. 04.10.2015, Spanish premieres of Desde el Instante (2001), version for solo bass clarinet, and Primer libro del canto alado (2006), for piccolo, flute, flute in G and bass flute.
. Madrid, Spain, Teatros del Canal, Sala Verde. October-2015, Quod Libet music magazine, new article on Javier Torres Maldonado's Music (only in Spanish), LINK. 24 and 25.07.2015, Mexico City, World premiere of Di natura artificiale, for orchestra, work commissioned by the Minería Symphony Orchestra. Concert season of the Mineria Symphony Orchestra, Sala Nezahualcóyotl, Centro Cultural Universitario, Mexico City. Mineria Symphony Orchestra Conducted by José Areán. 03.07.2015, Rome, Italy, Iridiscente, for piano, percussion, electronics and video (2010-2011), Italian premiere, Concert of GRAME (Centre National de Création Musicale) of Lyon, France, Sala "Alfredo Casella", Accademia Filarmonica Romana. Performers: Candida Felici, piano, Yi-Ping Yang, percussion, Max Bruckert, sound engineering and informatics. Original video: Danio Catanuto. This project awarded the special prize Rutas Escenicas'' (Mexico/European Union). 17 & 18.06.2015, Mozarteum in Salzburg, Austria, Composition seminar (2 lectures): 1. Sound objects, dramaturgy of music and compositional processes, 2. 2 to 4.06.2015, University of Malmö - Lund University - Malmö Academy of Music, Sweden, Composition lectures on my works. 29.05.2015, Conservatory of Como, Composition and electroacoustic composition seminar (2 lectures): "Time, space and musical invention in my work". 23.05.2015, Seville, Spanish premieres of De ignoto cantu, version for 3 instruments and electronics and Huayra-Yana, version for barytone saxophone and electronics. In the same concert it was played Alborada, version for soprano saxophone and electronics. Jornadas de la Música Electroacústica Mixta, Concert of the Ensemble Zahir. Auditorio CICUS, 20 h., c/Madre de Dios 1, Seville. 09.02.2015, Paris, World premiere, Destellos, abismo (2007-2010), for voice and ensemble (5 players), work dedicated to Armand Angster and Françoise Kubler. Lyiric Text: Jose Manuel Recillas. work commissioned by the French Ministry of Culture (Commande de l'État 2006) for the Ensemble Accroche Note. Lyiric Text: Jose Manuel Recillas. Festival "Présences", Radio France, concert N°3, Ensemble Accroche Note. Live broadcasting by France Musique - Radio France. 02.2015, Javier Torres Maldonado is the composer nominated to the Cátedra "Manuel de Falla" 2015, he was in residence at the Conservatorio Superior "Manuel Castillo" of Seville, collaborating with the Ensemble "Taller Sonoro". He chose 10 young composers, they were in residence composing new works under his supervision throughout 2015. The pieces were played by the Ensemble "Taller Sonoro" at the Festival de Cádiz 2015. Javier Torres Maldonado taught a series of lectures on his music throughout the year at the Conservatorio "Manuel Castillo" of Seville as well as during Jornadas de la Música Electroacústica of Seville. Different pieces of the composer were played in during his residences. Interview to Javier Torres Maldonado by Camilo Irizo, Espacio Sonoro, Spanish magazine on contemporary music, LINK. 01 to 06.09.2014, Bordeaux, France, composer in residence: SCRIME (Studios de Création et de Recherche en Informatique et Musique Electroacoustique), composition/research project: Viaje, opera or musical dramatic action for 4 singers, ensemble and electronics, work commisioned by Festival Internacional Cervantino, residence supported by Compagnie Le Grain - Théâtre de la Voix, LINK. Prize Ibermúsicas/Iberescena awarded by Javier Torres Maldonado and the choreographer Jaciel Neri for "Rostros de humo", a new work for ensemble and dance. January 2014. Paris, Commande de l'État 2013 by the French Ministry of Culture, Composition project: String Quartet No. 2, composed for the Ensemble Sillages. Nice, France, composer in residence at CIRM (Centre National de Création Musicale), 16 to 21.06.2014, Composition & research project: Viaje, chamber opera or musical dramatic action for 4 singers, ensemble and electronics, work commisioned by Festival Internacional Cervantino. LINK. 06.12.2014, Florence, Italian premiere, Masih (2013), for saxophone quartet, work commissioned by Sigma Project Quartet and Conaculta. GAMO International Festival, Marino Marini Museum, Italian premiere, Sigma Project Quartet. 09.12 and 01.08.2014, Mexico City, Rostros de Humo, for 16 instruments divided in 3 instrumental gruoups and 2 duos and dancers. World premiere (Prize Ibermúsicas / Iberescena), Jaciel Neri, choreographer, Ensemble Cepromusic, Jose Luis Castillo (conductor). Prize Ibermusicas/Iberescena for a musical and choreaphic project. 23.11.2014, Valencia, Spain, Masih, for saxophone quartet, work commissioned by Sigma Project Quartet and CONACULTA. Auditorio Rafaelbunyol, Projecte Rafael Festival, Valencia. 22 and 24.10.2014, Guanajuato, Mexico, Viaje, chamber opera or dramatic musical action for 4 singers, ensemble and electronics. World premiere, work commisioned by the Festival Internacional Cervantino. Seban Manoukian (soprano), Baltazar Zúñiga (tenor), Camille Royer (mezzo-soprano), Alberto Albarran (baritone), Compagnie Le Grain-Théâtre de la Voix (Bordeaux), Ensemble Sillages, Nicolas Chesneau (conductor), Christine Dormoy, stage director. Teatro Juarez, Guanajuato, Festival Internacional Cervantino.